For 15 years, Phil King has been proving that design should have a seat at the leadership table — carrying equal weight on strategy and prioritization responsibilities with product, business, and engineering executives. Moving up the ranks at eBay before taking the reins as Director of User Experience and Design at Flickr, he contends that successful businesses are built on well-designed customer experiences, and that the best design leaders never let go of their roots in order to produce the best results. Having led one of the world’s largest photo enthusiast communities (with over 100 million members) through a massive and closely-watched redesign, King has a lot to say about leading a team to create products users will love. In this exclusive interview, he talks about how designers can become strong design leaders and make change at companies of all sizes. After several years designing at startups, King joined eBay as an individual contributor with an interest in interaction design in 2004 before moving into management less than 18 months later. As a larger company, eBay’s culture encouraged specialization. Interaction designers focused on how things worked. Visual designers focused on how things looked. It was a hard environment to be a generalist, but it’s one of the qualities that drew King into a leadership role. He worked to bring the specialists on his team at eBay together as a group, helping project teams form, understand, and solve design problems seamlessly. Growing skills as a generalist designer, and especially seeking opportunities to use broad design thinking to support your team are key steps to operating as a designer at the leadership level. Go above and beyond to understand what all of the other members of the design team are engaged in and share what you are doing with them. Fostering collaboration strengthens the work and bonds within the team, even in the face of tough deadlines. Proactively solicit feedback from your peers, not just your manager, and alert them when you are putting their advice into action. We all like to work with and for others who continue to learn, and who appreciate support. Spot opportunities to be a mentor. When someone asks for help, be the one to volunteer. Prove that you’re there to make everyone better at what they’re doing, including yourself. Don’t shy away from learning new skills. Remaining a capable generalist helps design leaders remain close to their whole team and the work. Absorb, document, and share. As you learn new things, make observations, see best practices in action, take notes. The person at the whiteboard often has the best opportunity to guide and influence conversations. The more time you spend genuinely listening and understanding what each person on the team is doing, sharing your thoughts along the way, the easier it will be for you to step into a leadership role. If you move up from within the team, you’ll have earned their respect as someone who listens and deserves to be listened to. Interest spawns credibility. It’s not only important to learn the ins and outs of other people’s roles, you should also strive to understand the various pressures people face. Who is working against the most challenging timeline? Who is trying to hit strict product requirements? Who is frustrated with the lack (or abundance) of feedback around something they are trying to design? By asking these questions, you not only get a front row seat to how to solve these problems, but you develop empathy for different situations, King says. The more of these conversations you have, the more knowledge you can share across the team. You can become the conduit that connects people with solutions, advice, and other teammates who may have helpful expertise. After a while, the value you add will become evidence-based — most design leaders have a proven track record of good judgment and successful outcomes. Building empathy with the extremely diverse customer base at eBay required many of the same skills a leader can use to understand and influence their team. “The product and design teams at eBay invested a great deal of time learning about the whole ecosystem of buyers and sellers — asking questions, observing how people used our products, and listening,” he says. A similar inward focus on your own teams can help build trust, collaboration, and ultimately better results. At most startups, the first design hire becomes the design head. Suddenly, they have the responsibility of hiring a team, when that was never part of their skill set. If you’re in this situation, where do you start? King’s advice: With yourself. Do a thorough audit of the skills you have in your personal arsenal. Whatever you don’t have in spades, find someone who does. While King joined Flickr in 2008, the small design team was already deeply ingrained in the product definition process. He spent time learning what aspects of their work each designer enjoyed the most, where they had the best results, and what skills they’d like to develop. Patterns began to develop making it possible to visualize where the team was strongest and where gaps existed. As the team grew over the years, hiring people to fill skill gaps and keep the environment fresh and creative was one of his highest priorities. Involve the team. If you are growing an existing team, the people who are already on it should be excited about new people joining, too. Involve the team in assessing where additional strength in one area or another is needed. An engaged, self-aware team can improve the process from defining a new role all the way through onboarding. Gauge self awareness and humility. When interviewing candidates, look for them to acknowledge that they are joining an intact team. Even if it’s a team of one at the time, they should express their willingness to learn about the organization and the processes you already use. Design candidates should meet with and be curious about the engineers, product managers, and other team members who they’ll collaborate with on a regular basis. Optimize for collaboration. As a leader, you don’t just want your team to be effective individually. A design team needs to effectively critique and support each other’s work. Start by knowing how different members of the team are currently working together, and consider how the candidate could join an existing project team and make it stronger (or not). In 2012, Flickr kicked off a massive redesign that completely changed what the service looked like and how it was used. Given that Marissa Mayer stepped in as CEO of Flickr’s parent company, Yahoo, in July that year, one might guess that the shift was part of the changing of the guard. 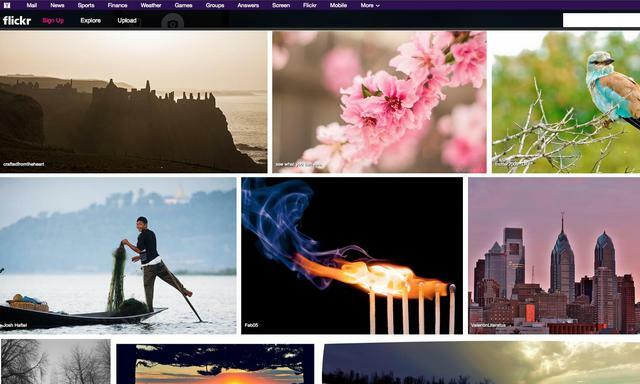 In fact the team at Flickr had been stepping towards a redesign for several months. “A design team should be empowered to explore ideas even when challenging deadlines loom,” he says. “By late 2011 all of us recognized the need to redesign Flickr in the context of all the growth happening in the photo space.” This included the rising dominance of Facebook, photo-sharing powerhouses like Instagram, and an increasing number of photography hobbyists emboldened with tools like Lightroom and Aperture. Ideas and sketches for a redesign started circulating in the team’s weekly critique sessions. “Ideally all big changes come out of a bottom-up approach where everyone on the team is really excited about doing something different. The main leadership challenge here was to organize and direct that energy into a collaborative effort with the rest of the Flickr team,” King says. At the time, Flickr had reached a level of complexity where the design team was obligated to build in more features to serve a larger, more diverse audience. At the same time, they needed to maintain the simplicity and intuitive nature of the interface that users were accustomed to. Above all, the design team wanted to reinvest in making photos the heart of the Flickr experience. They had the opportunity to completely rethink how it would deliver on this promise. Before the project could get underway, it was King’s job to help the team consider every detail — this included getting the rest of the company on board with substantial change. Be strategic. From the outset, the design team was joined by product managers and engineers to help determine key priorities and process for the redesign. This involved design in shaping the overall strategy for relaunching the product and helped the team focus their effort most effectively. Be inclusive. Freely share your process with anyone who asks (even those who don’t). You want your colleagues across departments to have time to get comfortable with new concepts. The Flickr design team printed out all of their explorations and posted them in a central location. This allowed them to collect feedback from everyone, ask questions, spark conversations, and give the entire company an inclusive feel. The whole team felt comfortable questioning, poking holes in, or outright tearing down ideas. Optimizing for involvement helps gather the best feedback, and address pushback sooner rather than later. Present ideas as ideas.You’re setting yourself up for failure if your ideas are set in stone when you share them. Be clear when ideas are still malleable and build empathy by encouraging team members to explain their concerns. Make sure you record and fold the input you get into alternative ideas that you also present to make people feel heard. You may end up with something better. Once you have a bunch of options laid out, and have equipped yourself with feedback from a wide cross-section, it’s time to pick out the ideas that are most relevant and prioritize them. When you’re making these kinds of calls, you have to first make sure you’re among the right company. For the Flickr redesign, King and the team worked with point people from engineering and product (in this case, the front-end engineer lead and the head of product). Having them in the conversation assured their respective teams that their priorities and concerns were being addressed. You can't hold too tightly to past decisions. Accept that things change quickly. Having engineering and product present was especially important for exactly this reason. Every feature that ended up on the cutting room floor had been backed by someone who felt very strongly about it. In many cases, it was an engineer or product manager, and it was important for them to have a forum to provide context and explain why and if it was still important. “In some cases, features were more important than we initially thought, or we were able to use them in a different way that made more sense,” says King. It isn’t a design leader’s job to have all the answers, but it is their job to help the team go out and find them. To tackle the redesign, Flickr organized into “pods,” each representing a different area or feature, including mobile, uploading, sharing, etc. Each pod had a product manager, a designer and several engineers charged with fully understanding and developing their part of the project along an aggressive timeline. Ultimately, the pod structure yielded positive outcomes — which King attributes to heightened focus and faster communication. Everything is easier to build when you can turn to the person next to you, check in and provide feedback immediately. While pods were free to organize their work internally, emphasizing a few pieces of simple design process improved the strength of the product as well as the team. Every bit of process can feel like an enemy to progress. You have to whittle it down to the essentials. 1) Frequent check-ins.He made sure to meet with each designer assigned to a pod to stay up to date on both the actual work at hand and the interpersonal relationships within the pods. Was the designer feeling inspired? Involved in setting priorities? Blocked by any issues? He’d ask these questions to make sure pods were functioning as smoothly as planned. “I wanted to make sure they felt like they were building their skills outside of what the pod was focused on or teaching them,” he said. 3) Present to senior staff.“I wanted each designer in the pods to be accountable for their work, which required sharpening skills to present designs and gather feedback at executive reviews. Choosing the right level of detail, educating stakeholders about key considerations, and predicting what sorts of questions will come up during a review are critical skills for designers, and I wanted the team to be comfortable presenting to anyone.” Regular individual and group critique sessions created opportunities to practice —and for King to coach as needed. When Facebook, Twitter and many others moved into mobile in a big way, Flickr made its move by hiring a designer with significant mobile experience. Because this was a new area for the company, the designer was essentially responsible for creating the design strategy and execution plan, but also reviewing and iterating with King and the rest of the team. A leader encourages the team to invest in their tasks and take responsibility for driving projects forward. On the accountability side, design leaders should ask to see work early and often, and need to be able to ask educated, insightful questions that will make the product better. “Ask why something is the way it is. What are they hearing from the rest of the team in terms of requirements? What requirements are they pushing back against? What is the biggest problem they are trying to solve at this moment?” he says. As King puts it, during development, a design leader can be the product’s most important customer. They’re the one person who should constantly be interacting with features spearheaded by different members of their teams, checking the fit with company priorities and with customer needs. “Basically, you’re the one who makes sure that features and designers speak to each other, keeping the product design moving in one direction,” he says. The second part of ensuring impact for your team is representing it well to the rest of the company — being a vocal advocate. Design teams can sometimes be viewed negatively as the folks who swoop in at the end to put a coat of paint on what other people have worked hard to build. Design leaders should do everything they can to bust this myth by creating space for designers to be involved from the start. Design thinking is necessary at every stage of development. To make this happen, he advises going to every meeting where you could contribute, even if you weren’t explicitly invited. Be an active participant. Informally facilitate conversations across functional areas to weave design thinking into their problem solving process. “Facilitating product reviews or strategy sessions can be similar to running a brainstorm or usability session for your product. A design leader may be best equipped to ensure that everyone around the table is participating equally, seek clarification if you sense disagreement in the room, and help keep the group focused on the task at hand,” King says.